Please don't all choose the fight between Aang and feu Lord Ozai. There was some other epic moments through the series. The last two Zuko vs. Azula fights were both decent. The last confrontation ended with some bullcrap but otherwise they were pretty good. The one in the underground city in the season 2 finale. 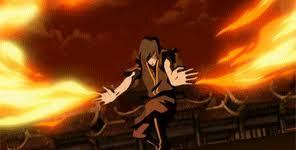 The last Agni Kai between Azula and Zuko in "Sozin's Comet" part 3. Their power being intensified par the comet, the flow of their movements, the musique especially, made this an incredibly dramatic scene.